Hey, I’m Jonathan. I’m a husband, dad to 2 little princesses, entrepreneur, small business owner, fitness enthusiast, and mountain bike junkie! I live in the greater Los Angeles area, but love to vacation and visit family and lounge poolside in Scottsdale. We would love to have to stay at our home! Please reach out with any questions! 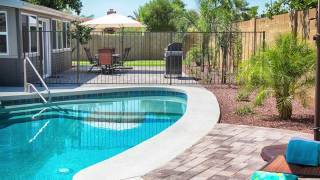 Great customer service, close to Kierland, Shopping, PV mall, Restaurants and More! PGA Tour, Barrett Jackson, Spring Training, Museums, hiking, and so much more! This place is AMAZING! First of all, Jonathan was great with communication back and forth. When we arrived the house was spectacular! Very clean and the backyard and pool were so much fun!! The neighborhood was quiet and the house was in a great location. The house was exactly as advertised and is place we would like to return to for sure!! Fantastic house done right! The host has certainly incorporated pretty much anything someone could think of to make the stay a great one. We came with three kids and they asked if we could stay forever or buy the house. Our kids loss is your gain as the property is still available. A great spot to take a break or launch into the Scottsdale/Phoenix area. Great Property and Host! We'll Be Back! We enjoyed staying at the house! It was absolutely beautiful, very spacious, very modern and clean! Thank you Jonathan for being so quick with booking, responding and staying in touch and most importantly letting us stay at your beautiful home. We would definitely love to stay there again next time we visit Arizona :) I highly recommend everyone to stay at this beautiful Turquoise home! I even had a travel agent, who is my friend, tell me she me she will recommend it for her clients after she saw the pictures! Thank you again so much! We Had The Best Stay! We had the best stay!! The house is stunning and every detail is thoughtfully considered. Jonathan is a great host, easy to get ahold of and very accommodating. The location is a little far from basic amenities so a car is required. I would stay here again in a heart beat. One of the best Airbnb’s I’ve ever stayed at. Great For Our Friends Trip! A group of friends and I stayed in this house for a few nights and absolutely loved it. It's incredibly clean and newly remodeled and done well. The area is quiet and nice. Don't hesitate to stay here when you're in Phoenix.